��� This is a retrospective documentary on the life and music of saxophonist John Coltrane, featuring reminiscences and interviews with his contemporaries and fellow musicians. ��� The documentary is narrated by Ed Wheeler and directed by Robert Palmer and Toby Byron. Because Coltrane died from liver disease in 1967, there isn't that much footage available and I sense they were struggling to find source material. Hence the reliance on reminiscences and lots of fancy zooms on stills. There is rare footage of Coltrane playing alto saxophone whilst in the Navy, and a few excerpts from concert and studio performances. Most of the footage is in black and white, apart from an excerpt of Coltrane's last quartet (featuring wife Alice Coltrane on piano and Rashied Ali on drums) performing in concert in colour. ��� The documentary focuses very much on the middle period of Coltrane's career, with only brief references to his rhythm and blue roots, collaborations with Jimmy Heath, and his participation in the Miles Davis Quintet. Much of the documentary focuses, perhaps rightly so, on the classic John Coltrane Quartet (with pianist McCoy Tyner, drummer Elvin Jones, and bassist Jimmy Garrison), from about the period of My Favourite Things to A Love Supreme. ��� Surprisingly, there is very little focus on John Coltrane's personal life - including his marriage to Alice Coltrane, his son Ravi, and the documentary even avoids talking about his death. There is also probably a bit too much focus on the avant garde and 'spiritual' nature of his music. ��� From watching this documentary, you could quite easily form the impression that Coltrane's music is mostly freeform with Eastern influences, and completely miss out on the intensely personal and soulful ballads that he is better known for by plebeians like me. Okay, okay, I admit it, I find A Love Supreme a bit hard to digest and far prefer albums like Ballads and Johnny Hartman and John Coltrane. Still, this documentary is worth watching for those wanting to know a little bit more about the jazz master. ��� This is presented in full frame, and looks like it was sourced from an analogue video master (probably originally intended for distribution on VHS and perhaps Laser Disc). ��� The quality of the transfer is okay, but probably a bit on the soft side. Much of the feature is in black and white, excerpt for the retrospective interviews and some concert footage at the end. ��� Fortunately, there were no compression artefacts that I could find, not even the pixelization often found on black and white scenes. ���� There are no subtitle tracks on this single sided single layered disc. ��� There is only one audio track on this disc: English Dolby Digital 2.0 (224Kb/s). ��� This is a pretty average sounding and TV broadcast quality audio track. There are no obvious faults, or any exceptional aspects, with the quality of the sound obviously dependent on the quality of the source material. ��� Dialogue was easy to understand and there were no audio synchronization issues. ��� Most of the historical footage has a monaural sound track, and to be honest I did not detect any real use of stereo. ��� Extras are pretty limited and basic. ��� The menu is full frame and static, but includes background audio. 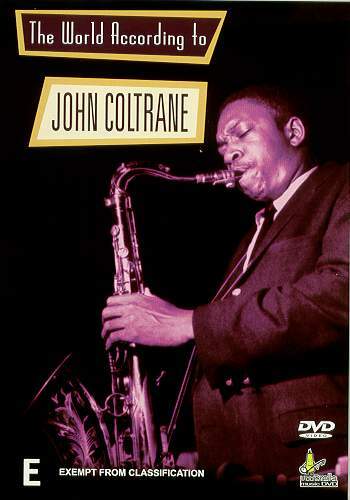 ��� This contains two stills consisting of a selection of titles of John Coltrane albums. ��� This consists of 11 black and white stills of John Coltrane in a variety of poses. ��� This is presented in full frame and Dolby Digital 2.0 (224Kb/s). ��� Region 4 wins ever so slightly due to the additional extras, but they are not substantial. ��� The World According to John Coltrane is a documentary about the life and music of one of jazz's greatest saxophonists. ��� The video transfer quality is acceptable. ����The audio transfer quality is also acceptable. ��� Extras are pretty minimal and include a photo gallery, discography and some trailers. Display Sony VPL-VW11HT LCD Projector, ScreenTechnics 16x9 matte white screen (254cm). Calibrated with Video Essentials/Ultimate DVD Platinum. This display device is 16x9 capable.